A wonderful combination of breath work, mindful movements and small meditations. An all level class and a great place to learn yoga postures or advance those you may be familiar with. Our Warm Hatha classes use infrared heat to benefit you therapeutically. The heat panels are designed to keep the room within comfortable temperatures which also allows for easy breathing. The benefits to practicing in warmth include burning fat effectively and increasing metabolism, detoxification, safe and easy stretching and opening of musculoskeletal structures, improved spinal integrity and nervous system function, rapid healing from injury and disease, and increased mental focus and discipline. This class moves at a moderate pace and is suitable for students already familiar with the postures learned in Hatha Yoga. We practice to align our yoga postures with our breath to create heat & stability. Flexibility, strength and clarity are natural side effects. Warm Yin yoga is a slow-paced style of yoga with postures, or asanas, that are held for longer periods of time in a warm infrared heated room—for beginners, it may range from 45 seconds to two minutes; more advanced practitioners may stay in one asana for five minutes or more. Warm Yin Yoga helps to release deep tissues, fascia, ligaments, joints and bone. Restorative classes are designed to rest the nervous system and help release deeply held tensions from the body. This is suitable and encouraged for yogis of all levels of experience. After centering the body you will be guided through some gentle stretches designed to gradually open the body and bring a sense of deep restoration. Yoga Truly loves children. Our Registered Children’s Yoga Teachers bring this scared practice to children ages 5-9. We know that children are natural yogis, they breathe properly, live in the moment, thrive on creativity, and are filled to the brim with compassion. A fun, yet structured kids yoga practice nurtures and encourages these qualities as children grow. The children have so much fun, they don’t realize we are working on social and developmental skills such as brain balancing and sensory integration. Private classes are available for children struggling with anxiety, trauma or other stress related conditions. Our yoga program for older Yogis & Yoginis incorporates body and breath awareness with mindfulness and small meditations. We learn to move through the postures and refine them as the students gain more control over their bodies and confidence in their practice. This is a learning and leadership based program with a curriculum that highlights both Yoga Philosophy and Physical Postures with an option for serious participants to work towards becoming a Yoga Coach and fulfill the prerequisites for Yoga Teacher Training, available to children age 15 plus. A gentle paced class teaches the foundational poses of yoga. Students will learn about the principles of alignment and breathing techniques that help us flow between poses. Beginner Yoga prepares your for regular attendance in Hatha classes. We will teach you how to prepare for practice, enjoy your practice and how to take your practice into daily life. Chair yoga modifies traditional yoga poses so they can be performed on or with the assist of a chair or other supportive props. These modifications make yoga accessible to people who cannot stand or lack the mobility to move easily from standing to seated to supine positions. We welcome you to this softer, slower paced, well supported and relaxing practice. Working with your changing body, the goal of our prenatal class is to prepare your body for labour, delivery and life after your little bundle arrives. This class is suitable for beginners experiencing a low-risk pregnancy. Flow & Go (VINYASA) Yoga is a flowing sequence of asanas (poses) coordinated with the movements of the breath. These classes will challenge your aerobic endurance, enhance flexibility, and build overall strength. You will create internal body heat by moving through Sun Salutations, standing, balancing, seated and supine poses. The result is improved balance, resilience and endurance. This vinyasa style class allows you to get your practice in, in a convenient, quick 45 minute format. Corporate Yoga has become a wellness initiative gaining increasing support by many yoga teachers and employers. Many studies have shown structured mindfulness practices and small amounts of physical movement can lead to much more productive and enjoyable workplace environments. Yoga Truly would like to participate in this initiative by bringing yoga to you and your place of work. We are already bringing yoga to school children to bring stress reducing movement breaks into their learning days. Yoga Truly has participated in many ‘out of studio’ yoga settings. We practice in parks, hospitals and nursing homes as well. Studio settings are preferable since we have the props most people require to experience the postures and practice, but we understand not always practical. We would like to support your wellness committee’s goal of bringing yoga to your staff. We have certified, registered and insured yoga instructors that can visit your workplace within the Niagara Region. 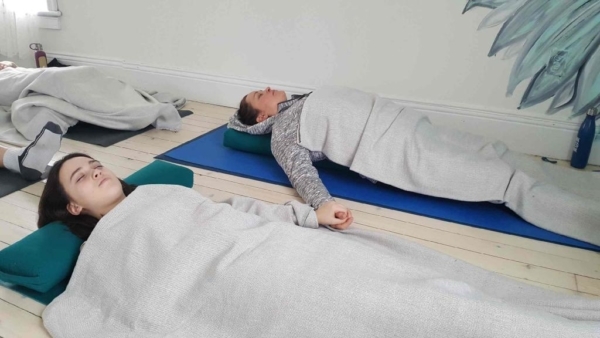 We can supply a small amount of yoga mats but ask that participants bring their own or the workplace supply chairs, many yoga poses and breathing techniques can be performed in your chair, right at your desk. *Participants will receive 10% off a studio 10 class pass following program completion. Sometimes we need guidance and help to keep our BODY, MIND and SPIRIT connected. If you’re new to yoga or prefer a more focused approach than our scheduled classes, join us for private classes. Private classes allows us to align your goals and intentions with a sequence of postures that will bring your physical and spiritual bodies to their highest potential. We will teach you the classical postures and techniques they require for optimal health and well being. Available for adults and children, and those recovering from injury that require a therapeutic approach towards healing through movement, mindfulness and breathing techniques. Most insurance policies will cover claims considered catastrophic. Yoga is great with friends. Semi-private yoga classes offers more fun and support when you bring your friends. We will schedule a time that works well with your schedule and design a practice specific to your requirements. Available for adults and children and corporate groups. An initial 60 minute meeting to discuss particular concerns with the your physical or emotional self. We include a detailed evaluation of emotional, behavioural and nutritional elements to help you achieve balance in all aspects of your life. Therapy may involve manual manipulation and adjustments to your body. Follow up sessions may be advised as required. A 60 minute relaxing and stress relieving session. Reiki Therapy promotes healing by using hands on techniques to improve energy levels and remove blockages in all systems of the body.